1. ‘Sniffing’ for bombs. Yes, bombs. It sounds like something from Get Smart, but it is real. The article seems more suited for dogs, or even ferrets, but a honeybee has an acute sense of smell, if you think about it. They can detect the complex chemical fingerprints of floral scents up to 2-3 km away, after all (that’s 1.2 – 1.8 miles for our US cousins). So the logical extension of this ability is to train them to detect other scents, not just pollen. That may sound silly, but never underestimate the power of rewarding a certain behaviour with -you guessed it- sugar. Sugar water, to be precise. Read the article and giggle the whole way through, but that doesn’t mean it isn’t fascinating or based on science. 2. Barriers to scent: a.k.a how humans manage to screw up smells for bees. The caveat to the above: we are polluting our world so badly with diesel exhaust that we are cutting down their ability to smell flowers. Sad but true. Ever stand near a busy road and inhale the exhaust whether you like it or not? It reeks. There’s a reason why I don’t roll my window down on the 410 when traffic is slow in August. Bees can’t hack it either, the diesel reacts to aroma chemicals in flowers and masks them. Suddenly they can’t find food unless they’re practically on top of it -500 m away. Starvation in the midst of plenty. Eek. 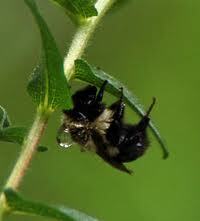 - Honey bees can sense changes in air pressure, but these are often not directly linked to the storms. -The hairs on the bee’s backs are sensitive and would be affected by electrostatic buildups in weather clouds. -Bees respond strongly to solar radiation… not simply to the intensity of light, but a more rounded response. Whether this is a direct stimulus, or a secondary effect due to the influence of solar radiation on plants’ ability to produce nectar is unknown. Under good flight conditions (reasonably calm and warm with flowers in blossom), the overall flight activity of a bee colony is reported to almost synchronize with changes in solar radiation levels. I am going to have to chase down the scientific studies to back all that up, of course. I’ll come edit this later and add them in if I can find them, or confess I have been misled. The other noted phenomena related to weather was that it can affect how aggressive bees are feeling, and produce more stinging when a hive is opened or bothered. The study was done here (http://link.springer.com/article/10.1007%2FBF02188929) and having cracked open a hive on a cloudy muggy day I have to say I have experienced it firsthand. The ladies are irritable, and I’ve learned to leave them alone. I think I will leave this post at the magical #3 and save the rest for another day. Hope this sends you off in wonderful quests to learn more, because I find Earth and all her creatures endlessly fascinating. The webmaster, and beekeeper. That is all. Painting Hives (or Not) -and Why, and With What?